Michelle May (violin); Leslie Deshazor Adams (viola); Cecelia Sharpe (cello); Rydell Chavez Smith (guitar); Kerry Lacy (bass); Jovia Amstrong (percussion); Julien Labro (accordion); Leah Lucas (viola); Naima Shamborguer (vocals); Pathe Jassi (bass); Marion Hayden (bass); Marc Sawasky (Percussion); Joel Peterson (guitar); Michael Gabriel (guitar). Musique Noire was formed in 2005. The group’s members, who reside in Detroit, MI and Chicago, IL are veteran players nationally and internationally. Led by violinist Michelle May, the group produces a sophisticated sound showcasing unique arrangements of jazz and world fusion. 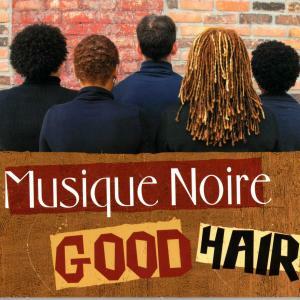 Their debut CD, “Good Hair”, is a collection of original songs (and three cover tunes) reflective of the bands many influences: Latin, funk, world music, and, of course, jazz. Members include: Michelle May, violin, Leslie Deshazor Adams, viola, Leah Lucas, viola and violin, and JoVia Armstrong, percussion. “Good Hair” features special guests Mark Sawasky (Immigrant Suns) on percussion, Cecelia Sharpe on cello, Naima Shamborguer and Angela Celeste May on vocals, Marion Hayden (Straight Ahead), Kerry Lacy, Pathe Jassi and James Francis on bass, Rydell Chavez Smith, John E. Lawrence, Michael DeLorean and Michael Gabriel on guitar and Julien Labro (Hot Club of Detroit) on accordion. The track “La Fiesta”, includes the flamenco dance steps of Valeria Montes (“La Chispa”). Thanks to all the wonderful musicians who took time out to lend their stellar talents to our project. We look forward to working with you again! Thank you to our engineers, Ben, Tom, Chris and Sean for making us sound great and to Jeffrey for making us look great! Thank you to our fans for holding it down, showing up and spreading the word -God bless you all!